A new and more virulent strain of a potentially fatal hospital infection is being seen in the NHS. At one trust - Stoke Mandeville in Buckinghamshire - 12 patients have died and 300 have been infected since 2003. Clostridium difficile, which causes severe diarrhoea, mainly affects elderly people, although the new strain has also affected younger patients. Health experts said measures to stop the bug spreading amongst patients have been introduced. Over the period in which the 300 cases have been seen, 225,000 patients were seen at Stoke Mandeville. The most recent death of a patient affected by C.difficile occurred in January this year. The Health Protection Agency said it was keeping a "watching brief" on the new strain. 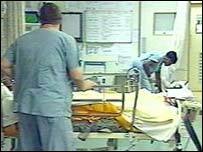 C. difficile, the most common cause of diarrhoea among hospital patients, was discovered in 1978. It usually affects the elderly, and can prove fatal if antibiotic treatment fails to kill all the spores in the gut, and they take hold again before the patient's own gut bacteria has had chance to mount a resistance. C.difficile is also very difficult to eradicate from the ward environment, which means it is easy for other patients to become infected. Experts say new strains, such as the one being seen now, do develop from time to time. Keeping them contained involves measures such as ensuring all affected patients are in the same ward, and preventing them from moving around the hospital and potentially spreading the infection to others. The most well-known hospital-acquired infection is the superbug MRSA (methicillin resistant staphylococcus aureus). But, while it has received the most attention, it only accounts for around 7,000 of the 300,000 hospital-acquired infections each year. 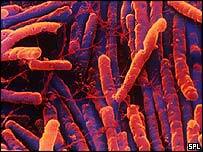 In 2004, there were 43,672 cases of C.difficile, a 98% increase from 2001. However, experts stress that much of this increase is due to the fact that mandatory reporting of cases was introduced last year. The spores of C.difficile are very hardy, and cannot be destroyed by hand gels, as the MRSA can. Healthcare staff must use soap and water to get rid of the bug, and hospital wards must be cleaned using more powerful disinfectants than usual to eradicate the bug. Liz Morgan-Lewis, a spokeswoman for the HPA, said it was hard to know how prevalent the new strain of C.difficile was, because comprehensive data was not available. She added: "It is not a new phenomenon to have a new strain, but this one had not been seen prior to the last two years. "This type is harder to control and does spread more rapidly." She added: "It's not something to panic about, but we are addressing the situation." A Department of Health spokesperson told the BBC News website: "The HPA has received some reports of this new strain and is keeping a watching brief on this but the available information indicates that this new strain is rare in the UK. "We are committed to reducing the level of healthcare associated infections including C.difficile associated diarrhoea." Dr Graz Luzi, of Buckinghamshire NHS Trust which runs Stoke Mandeville hospital - known for its spinal injuries unit, said the strain of C.difficile which had been seen at the hospital was very unusual in the UK. "We know that we are dealing with a very unusual and more difficult strain of C.difficile than has been seen in the similar outbreaks previously in the UK. "The trust continues to give this top priority in terms of getting on top of the problem." Stoke Mandeville has set up a helpline for any worried patients or their relatives. The number is (01296) 315539.